We celebrated our twelfth wedding anniversary on Sunday, so that means it’s been 12 years since 9/11/01. There are lots of posts about 9/11 on my Facebook feed this morning, prayers for peace, and “I will never forget” badges and the like. Me, I’m going to be spending the day trying to get organized for the kindergarten party on Saturday, getting the Battle of the Books stuff done, and paying bills. I think that’s ok. Life goes on. I was in Arizona over the weekend. It was 80 bazillion degrees the day we got there – the heat was so intense as soon as we got off the plane, it felt like being punched in the gut. 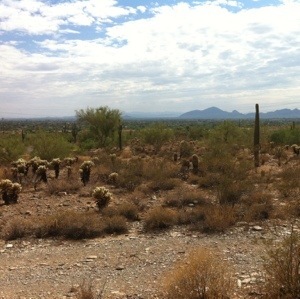 The desert is beautiful, albeit not beautiful in the way my Wisconsin soul typically imagines beautiful. We climbed a mountain, a little one anyway, on Saturday morning. I took pictures of every cactus I saw, fascinated by their foreignness. On Saturday night it rained, just a little, and by Sunday morning, the brown and seemingly barren mountain was green. It had exploded with life in the space of 24 hours. I think we humans are the same way. Give us half a chance, and like the desert with that tiny bit of rain, we won’t just choose life, we’ll seize it. There are moments when life seems fragile, but paradoxically, it’s tenacious at the same time. We’re tenacious. We have to be. So here we are, 12 years on, and our country is considering military action in Syria. I don’t have the answer. (Wouldn’t that be awesome if I did? Middle-aged suburban housewife solves Syria question. Sigh.) All I can tell you is what I’m trying to do, what I’m trying to teach my children to do: Choose life. Choose peace. Grow. It’s a question I get asked a fair amount. How can you stay in the Church, after the child abuse scandal? when they won’t ordain women? with their stance on homosexuality/health care/contraception? I sometimes feel like I’m targeted in a special way since I’m a political liberal, and that’s supposed to make me above religion, or beyond it, or something. I was sitting with my oldest child before her audition. She was calmly flipping through the pages of a fashion magazine, (and how do I have a child old enough to care about fashion magazines?) and I was freaking out. Not outwardly of course. Outwardly I was able to maintain some semblance of cool thanks to a miracle of multitasking, as I both looked at these shoes, that bag and especially this nail polish, and simultaneously offered up prayers to Saints Genesius, Vitus and Cecilia. Genesius was a 4th century Roman actor who was performing in a play satirizing Christian baptism when he himself felt the truth of what he was mocking and converted on the spot. Unfortunately the emperor Diocletian was not amused and ordered his execution. Talk about a bad review. Ba dum bum. Vitus was also executed by Diocletian as it turns out. He wasn’t a performer himself, but became known as the patron of dancers when a cult from the Middle Ages prayed by dancing before his statue. Rather more unfortunately, it also gave his name to a neurological disorder, but nobody’s perfect. Cecilia is the patroness of music and musicians, also a martyr, and the most well-known of the three I expect. However, I didn’t know until just now that she wasn’t a musician herself, but rather she heard “heavenly music” in her heart. The dates aren’t right for that music to have been J.S. Bach, but whatever. The Lord works in mysterious ways. Anyway, I passed the fifteen minutes before my daughter went in for her audition, and the half an hour it took until it was over, saying a few prayers, researching who Saints Genesius, Vitus and Cecilia were, and writing this post. I texted my Jewish husband, asking him, “What do non-Catholics do in situations like this?” He ignored me, being well practiced in that art. But seriously, I was so grateful to have some company while I waited. And there is a saint for every situation and every occasion, always there for the asking. Before I knew it, she was done, it was over, and I had only sprouted two or three new grey hairs. So you can keep your lonely religions, and your no religions. That’s totally fine by me, I promise! Me, I’m too much of a basketcase. I need at least a saint a day – look, today I needed three in the space of 45 minutes! So I’m a Catholic. Check in with me a different day and I’ll give you a different reason. There are a LOT of garments hanging in my wardrobe. My husband calls me a clothes horse, while I would say simply, “well-dressed.” I don’t really want to share those garments, and in fact, I’d like to add more to the pile. I told a friend after church today that were I to win the lottery (which would take a miracle, since I never buy a ticket) the only thing that would change would be the frequency with which I buy and the amount I spend on clothes. So if you tell me that those same garments, both real and imagined, are really the property of the poor, well, I might drop another expletive. So I guess the take-home is that Christ wouldn’t be using his hands to order clothes on the interwebs or his feet to walk to the mall? I have a LOT of work to do. Everything is a platitude and a cliche and…stupid after something like what happened in Newton, CT last week. That sentence that I just wrote is stupid in fact – after “something like” – please! Nothing has ever happened “like that” before. Yes, there have been horrors before, but each is uniquely horrific. And I’m sorry, but stop saying tragedy. It’s not a tragedy. It is the mother-loving Mayan apocalypse come one week early, and we ought to treat it that way. My mom card would be revoked. And yet there I go, being wrong some more, (I’m getting good at it by now!) because while, yes, it does sometimes seem like life is nasty, brutish and short, it’s the only one we’re given, at least as far as I know. So we have to just keep livin’, dazed sometimes, and confused often. My oldest last night, in a fit of melodrama, sobbed, “I just can’t make it!” “Through what?” I asked, genuinely bemused. “My life!” she whimpered. But that’s the task, sweet girl! That’s what we have to do, even in an unsafe world, my darling boy! We have to make it through. And we have to make something of it. And we have to make it count, hackeneyed chestnuts be damned. And we also have to enact some mother-loving gun control…but that’s another blog post. A Facebook friend’s recent post troubled me. (Maybe that sentence in itself is troubling, but whatever.) It was a link to a “Catholic” blog post in which the author condemned (not too strong a word) the voices that question the Church on anything, but specifically birth control. And then of course, I descended down the rabbit hole of the website, which seems to me to be totally focused on three issues: abortion (anti), gay marriage (anti), and health care (anti). And then I got super depressed, because is it possible for us both to be good Catholics, the Judgy McJudgerson author and me? Is there really no room for debate on any of these issues? Am I deluding myself when I try to be a good Catholic, because let me clear something up, not that there was any doubt…I have a lot of questions, and I struggle with the answers I get from my church, I really do. And you know what? I felt better…AND my laundry was folded. A happy ending. Somebody left a racist pamphlet on my doorstep today. It was in an orange newspaper bag. I saw other orange bags at my neighbors’ houses as I pulled into the driveway. I figured it was an ad for a landscaping company, or something from the village, or maybe a notice about a local food drive or something. It wasn’t immediately obvious what the paper inside was. I took it out and began to read. It was a two-page article about a Kansas City East High School incident where two kids (black) attacked another kid (white), allegedly because of the color of his skin. In addition to the article were two more pages filled with hatred (and grammatical errors, but that’s another, much less important soapbox) toward “blacks” a word which for the author evidently includes all Latinos and natives of India…and Jews for good measure, of course. I felt physically ill after reading it. The thought that somebody with that much rage in his or her heart was standing at the threshold of my home made me want to vomit. The realization that there are still people who feel this way made me despair. Ten years ago, I was in Vancouver, on the third day of my honeymoon. My husband and I (and it was still very strange to say those words) had woken up early, slightly before 6 am Pacific time and gone down to the hotel’s outdoor pool. I swam a couple of laps in the freezing cold water before joining Sam in the hot tub. A middle-aged man was there already. He was a veterinarian from Michigan, in Canada for a conference. We talked about bovine spongeform encephalitis, and my uncle Riley who was a sheep farmer. The world was quiet and dark, sleepy and peaceful. Only later did we learn that at those exact moments Sam’s hometown of New York was under attack, that when we returned to our house in Washington, DC, our world would have changed irrevocably. Now a decade has passed. My oldest daughter, who is named for my late uncle, is in the third grade and has two younger siblings. Sam and I celebrated our tenth wedding anniversary three days ago with beer and a Packers win. Every year on this day I remember that vet, I remember our fear and our deep sadness as we watched the towers come down and I shed a few tears. It’s good to pause and reflect, but this year, because it’s the tenth anniversary, the memorials have been overwhelming. They’ve come so fast and furious, I haven’t been able to find a still corner of my mind to think…which is why it was such a gift to see the readings for mass this morning. “The Lord is kind and merciful, slow to anger, and rich in compassion. For Catholics, the readings are arranged in a three year cycle. No one looked at the calendar and said, “Oh, forgiveness! that will be great for 9/11.” It’s a happy accident, or serendipity or divine intervention. Choose your pleasure or pick your poison. When I first saw these yesterday as I was preparing for today’s Children’s Liturgy, I hadn’t associated them with 9/11. I was thinking about talking to the kids about how hard it is to say, “I’m sorry” and how much easier it is to be the forgiver. But this morning, these readings slapped me upside the head. It is really expletive hard to forgive. (I’ll try to clean up my language in the hour before church.) That’s the job though. That’s what we’re supposed to do. If we’re using the anniversary of 9/11 to fan the flames of hatred we are missing the expletive point. Mercy, compassion, kindness, and healing. That is my 9/11 prayer for all of us. All of us. What am I missing? Here’s the passage referred to on the sticker. 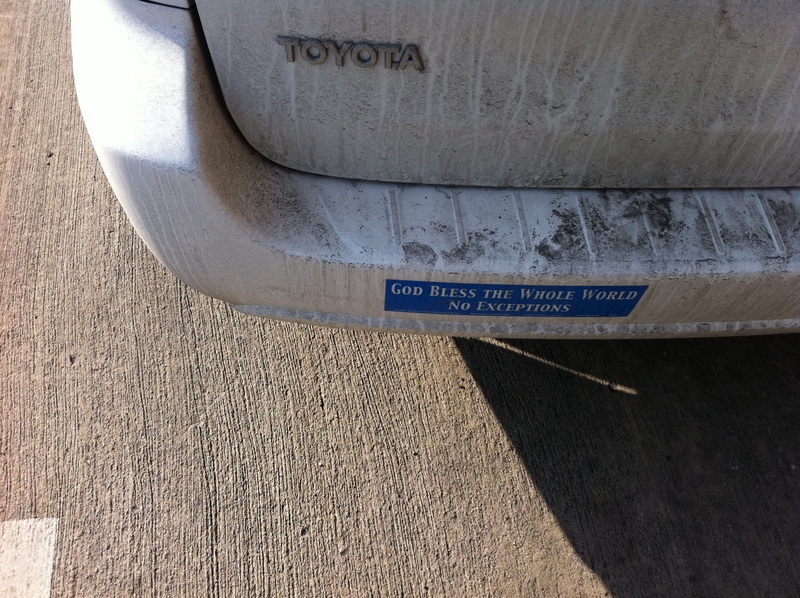 I don’t understand either the bible verse or the bumper sticker. Do you?